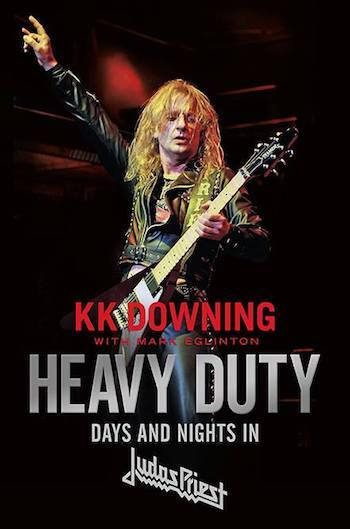 Former Judas Priest guitarist K. K. Downing will release his autobiography, Heavy Duty: Days And Nights In Judas Priest, on on September 18th through Da Capo Press. The book was co-written by the Scottish author and journalist Mark Eglinton, whose previous collaborations include Official Truth, 101 Proof with Rex Brown of Pantera and Confessions Of A Heretic with Behemoth’s Adam “Nergal” Darski. I’m proud to finally show you all the cover art for the U.S edition of my forthcoming autobiography. I’ve put my heart and soul into this book to give you, the fans, an honest account of my life in and out of Judas Priest. The book is available to pre-order here. “My life story is something that I am very proud of — even though I suspect that some of the details will surprise you just as they did me as I lived through them. Recollecting my life as I have done in this book has often brought me to close to tears, but has also made me laugh with the fondest memories. It is true that I have made many friends along the way but it is also true that I have made some enemies. But one thing is for sure: the music that has been everything to me has not only been my salvation, but has also brought me closer to the people of so many nations — and I can honestly say that I consider all of you to be my very dear friends. “Judas Priest formed in the industrial city of Birmingham, England, in 1968. With its distinctive twin-guitar sound, studs-and-leather image, and international sales of over 50 million records, Judas Priest became the archetypal heavy metal band in the 1980s. Iconic tracks like Breaking The Law, Living After Midnight and ‘You’ve Got Another Thing Comin’ helped the band achieve extraordinary success, but no one from the band has stepped out to tell their or the band’s story until now. As the band approaches its golden anniversary, fans will at last be able to delve backstage into the decades of shocking, hilarious, and haunting stories that surround the heavy metal institution. In Heavy Duty, guitarist K.K. Downing discusses the complex personality conflicts, the business screw-ups, the acrimonious relationship with fellow heavy metal band Iron Maiden, as well as how Judas Priest found itself at the epicenter of a storm of parental outrage that targeted heavy metal in the ’80s. He also describes his role in cementing the band’s trademark black leather and studs image that would not only become synonymous with the entire genre, but would also give singer Rob Halford a viable outlet by which to express his sexuality. Lastly, he recounts the life-changing moment when he looked at his bandmates on stage during a 2010 concert and thought, ‘This is the last show.’ Whatever the topic, whoever’s involved, K.K. doesn’t hold back. In other K. K. Downing news, the guitarist has opened a new concert venue in Wolverhampton, England. Called KK’s Steel Mill, the venue will host a number of hard rock and heavy metal acts over the coming months, including U.S. rockers Skid Row, who are booked to play there in August. Says Downing, “It’s with great pleasure and excitement I can confirm another new chapter in my lifelong musical journey, however this time on the other side of the crowd barriers. Last year, I was asked to visit this venue by a good friend, and together we agreed it would make an amazing place for fans to see top bands and artists close up in unique surroundings. The city of Wolverhampton itself and the Midlands in general has a great live music scene, with many new bands now making the breakthrough, not to mention the Old Guard of Legends still at the forefront driving the way. KK’s Steel Mill is very happy to have found its home at Starworks Warehouse. The historic building was the birthplace of The Star Motor Car Company around the early 1900s, and the building in its current format has kept that raw industrial feel. We aim to put on regular headlining shows throughout the year, and I am thrilled to announce for starters I will host American rockers Skid Row on Friday the 24th of August when Snake, Rachel, Scotti, Rob and ZP bring their hard-hitting show to the Steel Mill. The article mentioned “the acrimonious relationship with fellow heavy metal band Iron Maiden”. Well, in 2007 I emailed KK via his website and asked him why it was that he or the others in Priest had never said anything about the riff to the Maiden song ‘The Wicker Man’ being the same as Priest’s ‘Running Wild’. I also told him about how much I dislike Maiden. It could have happened a few years ago. I had a meeting arranged to go to his Golf course, which of course was his home, to see about possibly arranging an event for charity there. However due to a business clash on their side, I had to cancel and the meeting was never rearranged. Maybe the opportunity will present itself again?